I was a drama (and band geek) growing up. I loved to act or sing. Most people who knew me as a child would probably not have pegged me as someone who would get up on stage in front of a bunch of strangers. I was extremely shy. For me walking into a room filled with people I didn’t know was akin to torture. But somehow putting words in my mouth, whether from a play or song, didn’t bother me. Maybe in some weird way having a character to “hide” behind made it seem like it wasn’t really me up there. I remember distinctly the first time I auditioned for something. It was a church musical (which was set in the distant future of 2001, lol). I was probably 7 or 8. For the audition I had to sing a solo. When it was my turn everyone was very gentle with me. I guess maybe they were afraid I would freak out or faint or something, LOL. I said I was all right and started to sing. I’m pretty sure jaws dropped all around the room, because as it turned out I had a good voice. I was actually pretty surprised, too. I did get the part. I did plays and musicals throughout Junior and High and even majored in Theatre at Florida State University. I didn’t end up taking off for New York or Hollywood, but I still sing in my church choir and worship team and for a few years I was part of a Community Theatre Group. We did plays such as Beauty and the Beast, The Mousetrap by Agatha Christie and Harvey. So readers were any of you ever involved in plays or did you play an instrument? What are your favorite memories? Kristin writes inspirational romance and women’s fiction filled with love, laughter and a leap of faith. When she’s not writing her next novel, Kristin works as an advertising copywriter. She also enjoys singing in her church choir and worship team and playing flute in a community orchestra. Kristin is the author of the Covington Falls Chronicles, the Amazon Best-Selling series set in a fictional Southern town filled with memorable, lively characters. 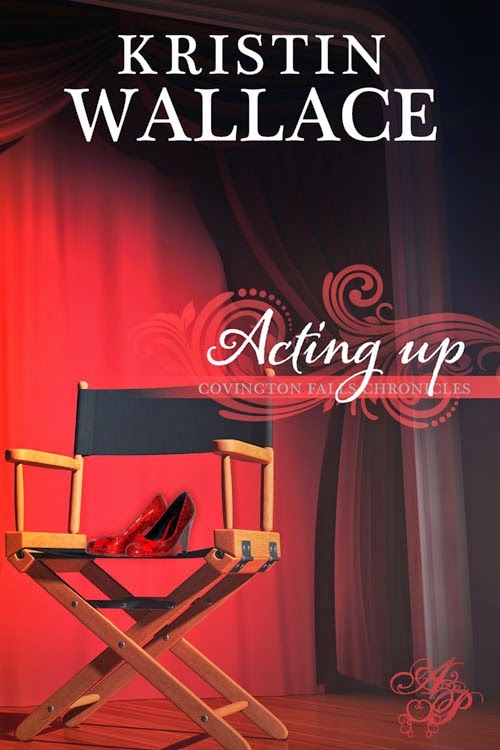 Book one (MARRY ME) debuted in October 2013 and the second book (ACTING UP) releases April 22. Also look for book three (IMAGINE THAT) on July 1. Reminds me of Glee! It's fun to hear of people's passions. Thanks for sharing. I love Glee (first few seasons anyway). I was in drama in jr. high, and performed with a church choir in high school, including "Bye, Bye, Birdie". Plus I played the drums. It was all so much fun, but my real passion was writing - I was writing skits in third grade. Such good times! We did Lil' Abner is high school. I liked to write stories too but I didn't figure out until much later that I wanted to be a writer "when I grew up". I heard you singing Kristin. You do have a lovely voice. As for me, if I open my mouth, people will probably rush out of the room. For the life of me, I can't sing a single correct note. My siblings and I made up plays. They were pretty lame though. LOL. We did too! We didn't have TV nor did we have access to many books until I was about 12, so we had to make up our own stories. Our poor parents had to sit through endless, rambling performances - but we all grew up to be writers! I've never acted and I can't really sing. (Or I don't think I can.) I've never had any desire to go up on stage and perform, apart from when I was little and loved all the play acting like all kids. My son is into acting and script writing and everything to do with film. He's very good as well. One of the things he's currently pursuing is voice acting. I hope he's going to narrate some talking books for me! So impressed with anyone who can get on stage and perform, Kristin! I'm much happier hiding behind my keyboard ... or blending into the audience. I'll clap with all my heart, though - just let us know when's your next show!